The Tech-Enabled Snack Delivery Brand Ranks 24th Overall and 2nd in the Food + Beverage Category. 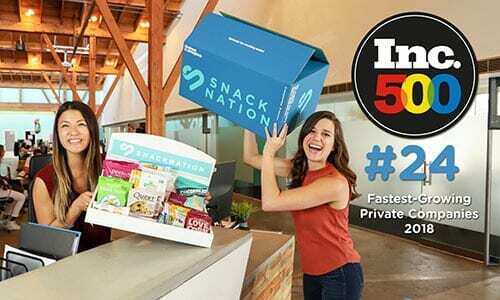 CULVER CITY – August 15th, 2018 – SnackNation, the leading nationwide tech-enabled, better-for-you snack marketplace ranked 24th on the annual Inc. 5,000, the most prestigious ranking of the nation’s fastest-growing companies. In addition to the top overall ranking, SnackNation placed 2nd overall in the Food + Beverage category which includes three brand partners featured in SnackNation boxes: Chomps, Chef’s Cut Real Jerky, and moringa superfood Kuli Kuli. This is the second recognition SnackNation has received from Inc. as the company was also named an “Inc. 2018 Best Workplace”. The Inc. 5000 list represents the fastest growing companies in the nation, based on percentage revenue growth in the previous three years. To qualify, companies must be based in the U.S., privately held, for profit, and independent. Complete results of the Inc. 500|5000, including company profiles and an interactive database that can be sorted by industry, region, and other criteria, can be found at www.inc.com/inc5000 and top 500 featured in the September issue. ABOUT: SnackNation is a tech-enabled snack delivery service that serves today’s most innovative, best-tasting, and emerging CPG brands to high value consumers at their most engaged moments. SnackNation exists to inspire more conscious food decisions. Founded in 2014, the company curates and delivers great tasting, better-for-you snacks to half a million people in thousands of member offices nationwide- places like Microsoft, MailChimp, Soothe, and many more. SnackNation is committed to fighting hunger outside the office too. The company has donated more than three million meals to Feeding America. To learn more, visit SnackNation.com.